Rocky Hills retreat is serious about its unwind time. Everything from cashmere blankets to the Huon pine bath tub on the deck to your own art studio will put you at blissful ease. You will have a 360-degree view of the lush valley and surrounding ocean at your own private modernist retreat. Rug up and walk to your own art studio with all tools provided! 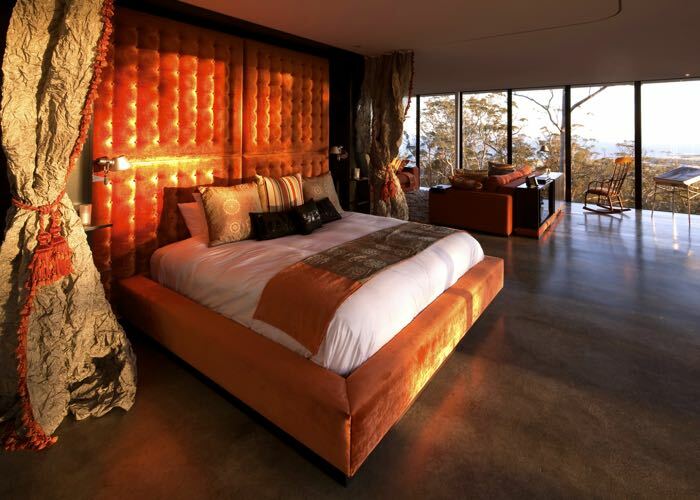 Rocky Hills Retreat paves your ultimate romantic Tasmania luxury holiday out for you. It is the perfect place to relax and reflect, with the secluded 250 acres of bush surrounding you. Designed by award winning architect Craig Rosevear, this stunning open space provides breath-taking views, especially when experienced from the outdoor Huon pine bathtub on the deck. This amazing secluded retreat has everything you need for a great stay indoors. Rocky Hills retreat provides breakfast provisions, opulent couches, cashmere blankets and a warming fireplace for you to enjoy. If you are inclined to make a day trip, you’re close to Swansea and the Freycinet Peninsula where there are more sights to see and senses to indulge. We bet it will be hard to leave the peace and comfort that Rocky Hills Retreat offers. Enjoy the beautiful scenery, Spikey Bridge, Kelvedon beach, pass Kabuki By the Sea, down the wiggly bits of the road when you arrive at Avalon (the glass house on the headland) which is on the left hand side - you turn right at the next driveway which is only 100 meters further along from Avalon. After about 30 minutes you will hit the water of Great Oyster Bay and Mayfield Camp Ground and the road narrows and starts to climb up a small hill. You will see the Rocky Hills township sign - turn left at the next driveway only about 600 meters along from the Rocky Hills sign. Go over the small stone bridge (circa 1830s) stay on the small corner of asphalt and then on to the gravelly driveway and head up the hill, it is 2 kms from here. Following the RHR signs continue on past the turn off to the Lair, up the hill past the driveway to the Murray's, continue on past the Rocky Hills stone gates, up the hill for another 600 meters to the next Rocky Hills Retreat stone sign turn left, you are nearly there, past the stone cairn (oval shaped sculpture) and down over the rise. A king size bed allows you to gaze out to the Tasmanian bush. Beautiful comfortable feather couches around the wood fire, superb kitchen, elegant dining table, laundry, walk in shower in the stylish bathroom. Out door decks, one with a Huon Pine bath for two. There is an Art Studio on the property. Tariff includes full breakfast provisions for your stay. There is a comprehensive mini bar with pre-prepared meals, BBQ options and delicious wines at extra charge.